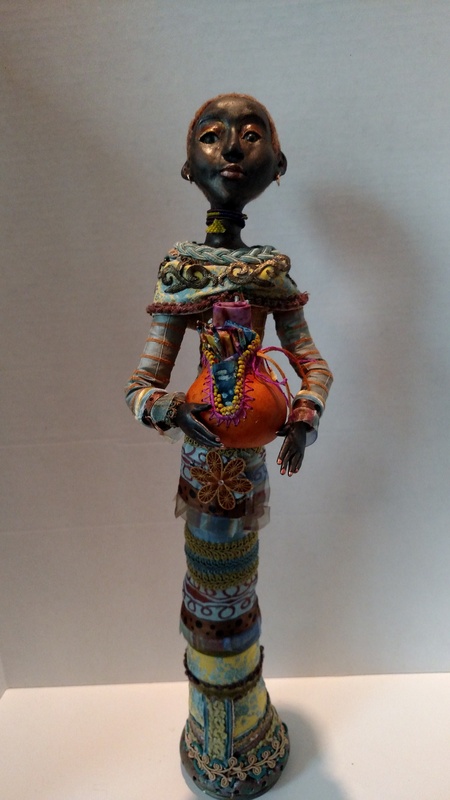 My art dolls transform cultural, spiritual and fantasy ideas into themes and meanings relevant to my life experiences. Polymer clay and cloth sculpting, luxury textiles and unique embellishment methods continue to introduce new ways to express my thoughts and creativity. Influenced by my own life among diverse people and cultures and what I imagine, think and feel, I attempt to bring characters to life. My love for dolls dates back to my vivid imagination as a small child playing with make-believe “fairies” in my grandmother’s flower garden and attending formal doll parties. I attempt to reach back and see through the fresh eyes of a child to capture the magic and bewilderment from that period. I transitioned from a career as a corporate executive to nourishing my soul and creativity making art dolls in my Charlotte, NC studio. Art Dolls Featured: Ciel Gallery-Charlotte, NC, Pineville Civic & Cultural Arts Center-Pineville, NC, Levine Children’s Hospital-Charlotte, NC, Gastonia Public Library –Gastonia, NC, Charlotte Quilters Guild Shows, African American Atelier Gallery “Angels” & “Founders” Exhibits-Greensboro, NC, North Carolina Museum of Dolls, Toys & Miniatures-Spencer, NC.